Summary: Egypt’s presidential election promises to be a lesson in ‘façade democracy’ and is unlikely to resolve any of the basic issues that Egypt faces, despite the IMF’s recent words of encouragement. We are once again grateful to George Joffé, Research Associate at the London Middle East Institute in SOAS, for the article below. Egypt’s new National Elections Authority has decided that, between March 26th and March 28th this year, Egyptians resident in Egypt are to vote in the first round of the elections which will decide who the country’s next president will be. Egyptians living abroad will already have voted eight days earlier, between March 16th and 18th in the embassy in their country-of-residence. If the winner gains an absolute majority of the vote, then his victory will be announced on April 2. If nobody has an absolute majority, a run-off election will be held on April 19th-to-21st for Egyptians resident abroad and on April 24th-to-26th for everybody else, with the final result being announced on May 1st. If there is only a single candidate, then only 5 per cent of the electorate will need to vote for him for his victory to be assured. Of course, there is little doubt as to who the victor will be. Abdelfattah al-Sisi, the present incumbent, has gone out of his way to guarantee his victory by ensuring that he would not face a credible opposition, although he apparently does not want to count all his chickens until they have hatched for he has been exhorting the electorate to turn out to vote, insisting “Choose whoever you want but vote!” The choice, however, is very limited for, of the eight candidates who put themselves forward as presidential hopefuls, seven have stood down or have been excluded from the election. The reason? Quite simply, it was made very clear to each of them that their participation was not only unwanted but could also place them in personal danger. Thus one of the earliest candidates, Ahmed Konsowa, who had been a major in the army, suddenly discovered in December that he was under arrest and faced a six-year jail term because he had broken a military regulation by attempting to stand as a candidate whilst still on active service – he has tried several times to renounce his commission but his attempts have always been refused. A similar fate awaited a more prominent soldier, General Sami Anan, a former chief-of-staff and Supreme Council of the Armed Forces (SCAF) member, when he declared his candidacy in defiance of the president’s threats to those who tried to “come close to this chair [the presidency]”. Three days later, he was arrested on January 24th, 2018 on the same grounds as Major Konsowa, after SCAF accused him of breaching military regulations and trying to create a schism between the military and the population. There were two other serious candidates, Ahmed Shafik, who had been Hosni Mubarak’s last prime minister and had stood against Mohammed Morsi in the 2012 presidential election after Hosni Mubarak had been deposed, and a well-known human rights lawyer, Khaled Ali. Ahmed Shafik, the leader of the Egyptian Patriotic Movement, had been an early casualty; when he announced his intended candidacy, while he was in the UAE, he was promptly deported, and detained upon arrival in Egypt for two weeks until he withdrew, praising the president’s magnificent work for Egypt over the past four years. Noting what had happened to his colleagues in the presidential stakes, Khalid Ali, the head of the Egyptian Center for Economic and Social Rights (ECESR), withdrew his candidacy shortly after General Anan had been arrested, after having been warned that he faced being disbarred because of charges he faced of making an obscene gesture during a demonstration. Three other minor candidates were rapidly disposed of. El Sayyed Badawi, the chair of the New Wafd Party, was forced to withdraw because of resistance from within his party – it had previously been a vociferous supporter of the president! Anwar Essmat Sadat, the nephew of the assassinated President Anwar Sadat and the chair of the Reform and Development Misruna Party, suddenly discovered he could not even find a venue in which to announce his candidacy and made the wise decision to stand down. And, finally, Mortada Mansour, the mercurial chair of the Zamalek Sporting Club, the capital’s premier football club, who is a veteran opponent of Egypt’s powerful Ultras (organised supporters violently opposed to President al-Sisi) and supporter of the president, was clearly an unworthy opponent for the president, so he also abandoned his candidacy. President al-Sisi has clearly been immensely successful at clearing the field before the actual election. As Amr Khalifa, a major commentator on Egyptian politics, has said, the election has become an “incredibly well-organised theatre”. Seemingly too successful, however, for, just one day before nominations closed, Moussa Mostafa Moussa, the chair of the pro-Sisi Ghad Party, suddenly announced his proposed candidacy. Fifteen minutes before the final moment for filling nominations, he completed the formalities with the backing of 26 parliamentary assembly members and 47,000 signatures from the wider public and thus became the sole challenger to the incumbent. Nobody believes that this was anything more than a regime-orchestrated initiative to create the illusion of a competition for the presidency and to preserve the fiction that the election is contested. Public cynicism over Mr Moussa’s initiative was reflected in the subsequent call for an electoral boycott by the new Civil Democratic Movement coalition of opposition figures and the president’s furious threats with respect to the opposition and any mass protest that might result. His outbursts were not just empty threats either. Since 2011 the number of Egypt’s prisons has risen from 42 to 52 with a massive new complex promised for Giza and, of the estimated 106,000 prison population in August 2016 (Egypt does not publish official figures), 63,000 were believed to be political prisoners, up from 41,000 in 2015 when they included 29,000 members of the Muslim Brotherhood. The Sisi regime has also made increasing use of the death penalty since mass trials started in March 2014. In that year, at least 509 death sentences were handed out, 538 in 2015 and 237 in 2016, while 15 people were executed in 2014, 22 in the following year and 44 in 2016. Political protest was involved in more than 70 per cent of the death sentences and the execution rate is increasing with 15 people being executed last December and 14 more at the start of this year. In the three years between the Tahrir Revolution and the army coup in June 2013 there had been only one execution, according to Reprieve. It is little wonder, then, that the European Parliament condemned Egypt’s record on February 8th. Indeed, from the beginning of his first term, President al-Sisi had made it clear that he would not hesitate to confront protest and political violence. Draconian anti-terrorism laws appeared in the wake of the destruction of a Russian airliner taking off from Sharm el-Sheikh in October 2015 whilst sporadic terrorism has also emerged in Hurghada. The Egyptian army has swung into action, particularly in Sinai where it has been secretly aided by Israel which recently admitted at least one hundred clandestine missions there against local extremists now masquerading as Da’ish at the behest of Egyptian forces. Similar challenges have emerged in the Delta and in Upper Egypt whilst in the Western Desert, violence has spilled over Egypt’s borders from Cyrenaica. The president’s firm hand does not appear to have been very successful as the violence is escalating! Nor has President al-Sisi’s first term been marked by particular success in his other great endeavour; the revival of Egypt’s economy. Major infrastructure projects, such as the widening and deepening of the Suez Canal or the construction of a new Egyptian capital, have been greeted with popular indifference or disapproval whilst measures designed to stabilise the economy, as required by the IMF, have spurred suppressed popular anger. Indeed, the economy has only survived with massive external aid from the Gulf; up to the end of 2015, the Gulf states pledged $21-to-$23 billion, of which $18 billion was handed over. That aid has now stopped but Egypt still needs help so, in 2017, it agreed to a $12 billion loan from the IMF on terms that stirred up widespread dissatisfaction. Indeed, Lazards has recently estimated that the country will need aid totalling $30 billion a year for four years if it is to survive, despite its windfall offshore gas field discovered by ENI in mid-2015 which came into production last December. There have been political prices to be paid at home and abroad as well. 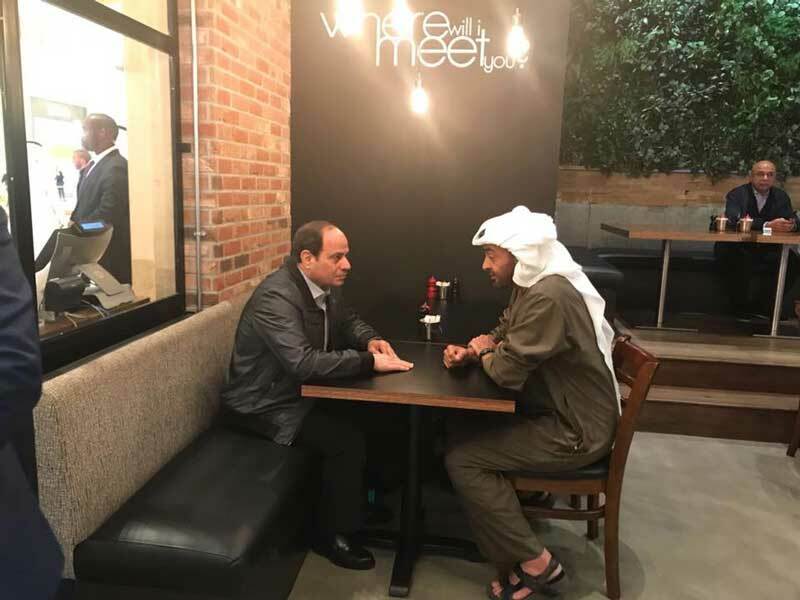 Gulf financial support certainly played a part in obliging the president to hand over two uninhabited islands – Tiran and Sanafir – in the Straits of Tiran – to Saudi Arabia in 2016. The move was intensely unpopular and generated the first large-scale protests against the president. Nonetheless, he forced ratification of the deal through Egypt’s National Assembly last June, mindful no doubt of the constraints on Saudi generosity. Egypt is also a reluctant supporter of Saudi Arabia’s and the UAE’s conservative coalition against Iran, no doubt because of their unyielding hostility towards the banned Muslim Brotherhood, although it still seeks to be the essential interlocutor for Hamas in the Gaza Strip despite its recent attempts to persuade public opinion to acquiesce in the designation of Jerusalem as Israel’s capital by the Trump administration early last December. At home the regime has presided over a massive expansion of the army’s economic interests to the disadvantage and disapproval of the private sector, alongside its repressive domestic policies. Yet it has no firm political base itself, unlike previous presidential regimes. Instead it relies on Tahya Masr, an informal coalition of independents in parliament with no formal party structure. The result has been that, in addition to widespread, if suppressed, popular unrest it has lost support from Egypt’s elites and institutions; business feels marginalised, youth is cowed and has abandoned its political activism, the middle classes fear impoverishment through economic reform, the judiciary has been alienated over the islands affair and now a power struggle is developing between the army command and the security services, particularly the General Intelligence Directorate, the Mukhabarat which had been in charge of the Fatah-Hamas reconciliation initiative. This culminated towards the end of 2017 in its head, Khalid Fawzi, being summarily dismissed to be replaced temporarily by President al-Sisi’s own eminence grise, retired general Abass Kamel. Given such a record of problems and disappointments, it seems a little surprising that Abdelfattah al-Sisi wants to embark upon his second presidential term at all! Egypt’s generals, however, have always found presidential power irresistible. The question is, however, whether President al-Sisi’s ambitions will be satisfied by just a second term or whether he will wish to emulate his predecessor, Hosni Mubarak, and extend his term-of-office beyond its constitutional limit despite his knowledge of what that eventually led to!